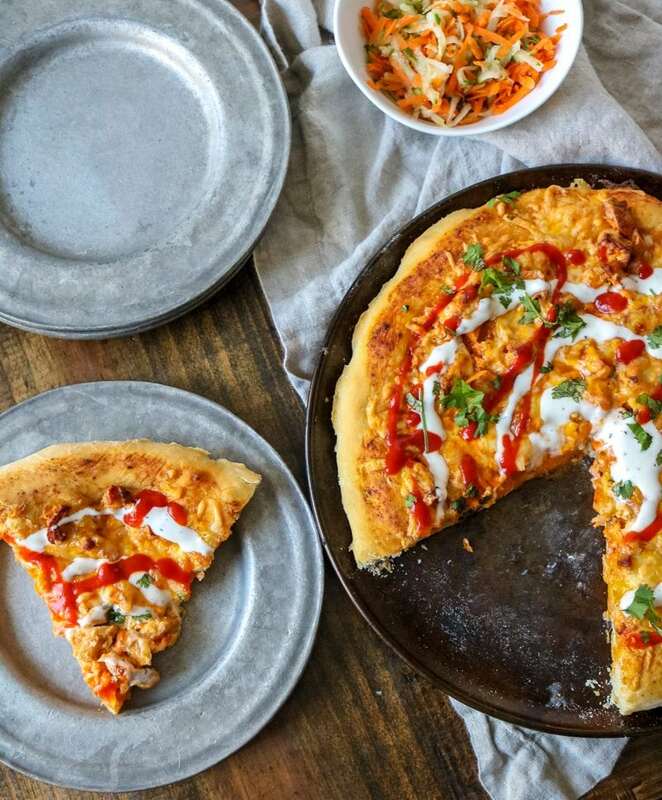 Buffalo Chicken Pizza is an easy recipe for pizza made with all the big, bold flavors of Buffalo Chicken! Spicy buffalo chicken is piled high on a tender pizza crust and smothered in cheese. This cheesy, spicy pizza is cooled down with a fresh ranch slaw made with carrots and cucumbers. Buffalo Chicken. Yet one more thing I just don’t think we would ever get sick of in this house. We frequently make Buffalo Chicken Bake , Buffalo Chicken Salad, Buffalo Wings, and Buffalo Chicken Tacos. You can surely tell it is one of our favorite flavor combos. 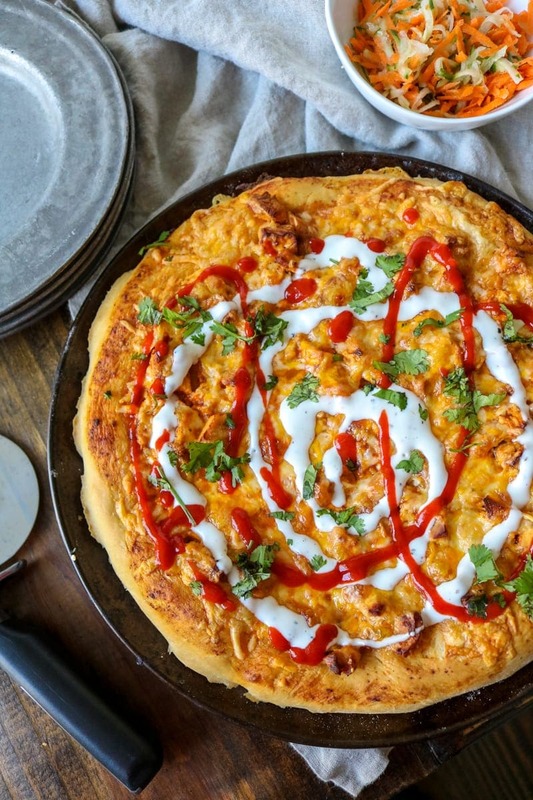 So it seemed perfectly logical to combine two of our favorites into one INSANE Buffalo Chicken Pizza! Bufflao Chicken Pizza has been done before, many times. In fact, we love to order a Buffalo Chicken Pizza from a specialty pizza joint. However, had it been done with a slaw on top? I top my Buffalo Chicken Tacos with a ranch slaw, so a recipe for Buffalo Chicken Pizza with a fresh carrot and cucumber ranch slaw, seemed like a good idea. I was right, this was a REALLY GOOD IDEA! 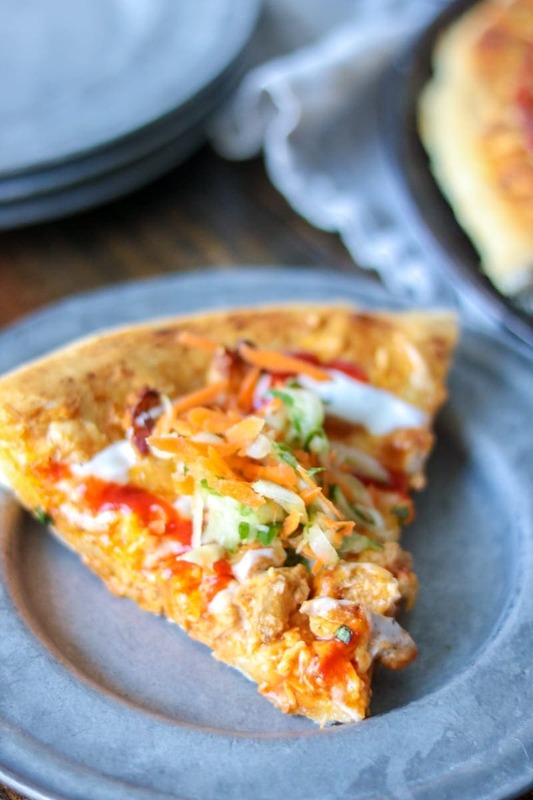 But of course if the ranch carrot and cucumber slaw does not sound good to you–serve this Buffalo Chicken Pizza with ranch or bleu cheese dressing, for a more classic combination for Buffalo Chicken Pizza. Prepare homemade pizza crust dough or use your favorite store bought pizza dough. Roll out the pizza dough on greased pizza dish. Chop up leftover rotisserie chicken or use shredded chicken breasts. Toss the cooked chicken with the hot sauce and butter if using. Generously spread out and the Buffalo Chicken over the pizza dough. Bake until the cheese is melted and browned and the crust is cooked through. Finely grate carrots and cucumbers. Mix together ranch seasoning with yogurt. Mix the carrots and cucumbers with the ranch. Refrigerate until pizza is ready to serve. Top pizza with slaw or serve on the side. I used a sharp cheddar and mozzarella combo for the best melting and flavor combo. Feel free to add diced celery to the carrot slaw if desired as well. Serve the carrot cucumber slaw on the side or right on top of the buffalo chicken pizza. Roll out pizza dough to about 1/4 inch thickness. Toss the cooked chicken with the hot sauce and butter if using, and spread generously over the pizza dough. Cover with cheese. Bake for 15-20 minutes, or until crust is browned evenly and cheese is fully melted. While pizza is baking, combine yogurt with ranch seasoning and stir until well combined. Toss with the cucumber and carrots. Serve the slaw with the pizza. Nutritional values are based on using butter the slaw. What a great idea to toss on a fresh slaw on this salad – genius! 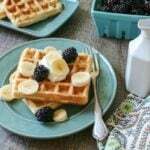 I could go some for breakfast right now! Well, it does have all the important food groups covered, right?! You know, I have never had buffalo chicken anything, well, except wings, but no dips or other goodies I’ve seen around. I really like the idea of putting it on pizza! And topped with that carrot slaw sounds fantastic! Oh my Judy!! You need to remedy this FAST!!! Buffalo Chicken is so much better when it is NOT in wing form in my opinion. Your world is about to be rocked. 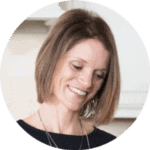 Thanks Christie–it really is a winner! yum. I love the slaw on top! sounds amazing! It really adds something unique Kristen. I could totally eat pizza every day of the week as well. This delicious one included! I like the idea of the slaw on top, it must really help balance out the flavor and textures. Yum! It truly does add so much freshness to this pizza! What an original idea! I am now craving this! This looks amazing… and the hot/spicy flavours with the cool & crunchy slaw… sounds perfect! Thank you! The slaw compliments the dish perfectly. LOVE the cool, crispy slaw topping here – looks fabulous! 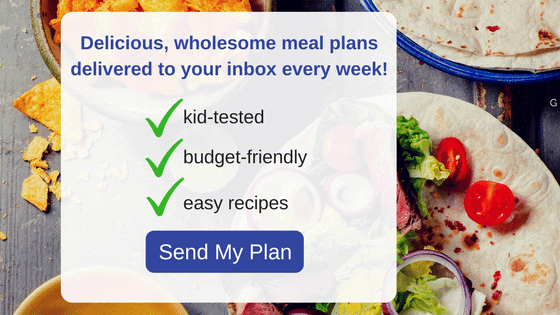 What an absolutley brilliant idea – just looking at this is making me hungrier than you know. Now, I must go eat breakfast! Ha!! The thought of this pizza always make me hungry too! How good doe THIS look! WOW! What a fun idea – I’ve never seen pizza with slaw on it! You had me at cheesy and spicy – yummy! This looks so delicious and love the carrot slaw as topping! Cheesey and Spicy adds so much! This made my day….wonderful flavors and the slaw just puts it over the top. I bet the crunch of that slaw is wonderful against the soft chicken and cheese. Looks delicious, what an inventive idea! The Slaw adds just an absolute incredible amount of yumminess! Perfect dinner any day of the week!